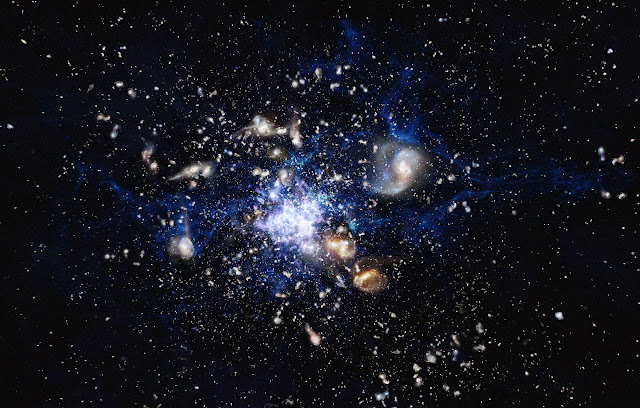 A galaxy cluster is composed of smaller galaxies held together by gravity. It is the largest object found in the Universe. Using the APEX telescope, astronomers probed the Spiderweb Galaxy which is a galaxy cluster 10.6 billion light years away. Formed by smaller galaxies, the Spiderweb Galaxy (also known as MRC 1138-262) has been studied for twenty years. It has been observed that the object contains a supermassive black hole and is a powerful source of radio waves. The data from the observation has surprised scientists with their discovery of the formation of the stars in the galaxy cluster taking place. They have noted that instead of the stars being formed from the filaments of the cluster, APEX data has shown that the star formation region is concentrated in one area and not even centered on the galaxy cluster itself. The Spiderweb Galaxy contains a supermassive black hole and is a powerful source of radio waves — which is what led astronomers to notice it in the first place. The object has thick dust clouds which the LABOCA camera on the APEX telescope can see through. Galaxy clusters are the largest objects in the Universe held together by gravity but their formation is not well understood. The Spiderweb Galaxy (formally known as MRC 1138-262) and its surroundings have been studied for twenty years, using ESO and other telescopes, and is thought to be one of the best examples of a protocluster in the process of assembly, more than ten billion years ago. But a surprise awaited the team when they looked at where the newly detected star formation was taking place. They were expecting to find this star formation region on the large filaments connecting galaxies. Instead, they found it concentrated mostly in a single region, and that region is not even centred on the central Spiderweb Galaxy in the protocluster.